The first product of its kind with award-winning swiss hair stimulating AnaGain™ and other brand-new ingredients sourced worldwide. RevivScalp™ helps target the actions of 5-alpha-reductase II, the signaling molecule that causes hair loss. Its ingredients address itching, stinging, irritation, and fights flaking, scalp odors and oiliness. Gently exfoliating, it can also encourage micro-circulation and a healthy supply of oxygen to the scalp. It can help increase penetration of actives to the hair follicle and fight hair loss. It adds smoothness, volume, conditioning and strength to hair, and helps fine, thin hair to look, feel and behave like naturally full, thick hair. Suitable for both men and women, and for use on color treated and chemically processed hair. 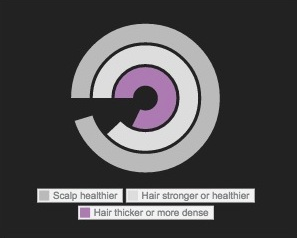 In a 21-day, 22-person consumer study of RevivScalp: 95% agreed that their scalp felt healthier; 86% felt that their hair was stronger or healthier; 82% agreed that their hair was thicker or more dense. ANAGAIN™ 4% is designed to successfully help fight hair loss and boost hair density, and according to Mibelle AG Biochemistry Switzerland, the developer of AnaGain, has proven to target the dermal papilla cells that are key to the hair growth cycle. Thanks to its double action, AnaGain can successfully boost the expression of the noggin gene, which results in a shorter resting period (telogen phase), and it can also enhance the expression of the fibroblast growth factor-7 gene. This sequence in turn can stimulate the proliferation of hair germ cells. In a clinical study, AnaGain increased the hair growth coefficient (the proportion of active hair follicles to degenerating ones) from 4 to 7.2 indicating a strong hair re-growing effect. AnaGain, based on a novel organic pea sprout extract, is thus a clinically proven solution targeting fuller and thicker hair. Here's a video. AnaGain won Beyond Beauty Lab’s Advanced Ingredient Award at its annual global showcase for personal care ingredients in Paris in 2014. REDENSYL® 1% from Induchem: The product combines two patented Induchem molecules - DHQG and EGCG2 - to help prevent hair loss by targeting hair follicle stems cells, reactivating the proliferation of ORSc stem cells, protecting them from apoptosis, maintaining their differentiation properties and helping to activate the metabolism of dermal papillary fibroblasts. Induchem's clinical assessment on volunteers produced outstanding results for Redensyl. In less than 3 months, 85% of the volunteers had significant and visible success, with +9% of new growing hair and -17% of falling hair. 85% of subjects showed positive results. Here's a video. RevivScalp contains 1% Redensyl, the concentration recommended for a wash-out product. From SILAB shows a significant inhibiting effect (-18%) on the activity of 5 alpha-reductase II, an enzyme responsible for follicle miniaturization. It targets the synthesis of a vascular growth factor, VEGF, that enables the vascular system development and favors the supply of nutrients. Test results show Anageline® leads to a 30% increase of the synthesis of VEGF. Extracted from two algae: Laminaria Digitata, known for its stimulating properties, and for its sebum flow regulative action; and Pelvetia Canaliculata, known for its anti-stress, stimulating and cleansing properties. According to SEPPIC, its manufacturer, in a study it was show to boost hair density + 10% and increase hair growth + 27%. Designed to help stimulate and prolong hair growth and strengthen hair from the roots. Cressatine® provides the elements needed to produce keratin for solid, well-structured hair and helps initiate regeneration via the Wnt pathway. According to its developer SEPPIC, helps reduce 5-alpha reductase, control sebum production, fight flaking and scalp irritation, and combat scalp redness and scalp & hair oiliness. It also helps fight unpleasant scalp odors. Here's a video. As a biomimetic acidifying agent, it helps attacked skin to regain its physiological acidic pH, ensuring its integrity. The vegetable-based esters making up this patented product have been shown to significantly inhibit the activity of 5-alpha reductase, even at low doses. Clinical tests have proved that 5 Alpha Avocuta® is capable of considerably reducing excess sebum in the skin and hair. It also helps prevent itching, redness and desquamation, and helps soothe the scalp. Works as a fast-acting “anti-nerve hyper-activator” to calm over-reaction of hypersensitve skin, and help prevent stinging, burning & tingling. According to Symrise, its manufacturer, SymSitive™ works at the cell communication level, directly connecting with a specific neuro-receptor -- the TRPV1 thermo-receptor -- bringing skin sensitivity back to a normal state to increase skin-tolerance and, over time, help to increase the skin’s resistance against stressors. CAPIXYL® (Red Clover Flower Extract), Niacinamide, Liposomal Caffeine, Arginine, Glutamic Acid and Hydrolyzed Wheat Protein all contribute to stronger, healthier, vibrant hair from bulb to tip. Shake well. To use, separate hair into multiple parts, applying RevivScalp directly to scalp using the treatment pump, about 6 to 8 pumps. Gently massage over entire scalp. Leave on for 10-30 minutes. A tingling and/or cooling sensation is to be expected. Rinse well and follow with an appropriate shampoo and conditioner. Use up to 5 times per week. The serum masque can be left on overnight if tolerated. CAUTION: For external use only. Avoid eye contact. If contact occurs, rinse thoroughly with water immediately. Keep out of reach of children. If redness, irritation, or excessive stinging develops, decrease frequency or discontinue use, and consult your physician or skin care professional. Do not use if you are sensitive to any of the labeled ingredients. Water/Aqua/Eau, Cetearyl Alcohol, Glycerin, Behentrimonium Methosulfate, Amodimethicone, Behentrimonium Chloride, Pelvetia Canaliculata Extract, Laminaria Digitata Extract, Hexylene Glycol (and) Capryloyl Glycine (and) Xylitylglucoside, Pisum Sativum (Pea) Sprout Extract, Butyl Avocadate, Niacinamide, Mentha Piperita (Peppermint) Leaf Extract, Water (and) Phospholipids (and) Caffeine, Capsicum Frutescens Fruit Extract, Trifolium Pratense (Clover) Flower Extract, Hydrolyzed Lupine Protein, Pentylene Glycol (and) 4-t-Butylcyclohexanol, Nasturtium Officinale Extract (and) Tropaeolum Majus Extract, Arginine, Trideceth-6, Benzyl Alcohol, Glutamic Acid, Serine, Hydroxypropyl Trimonium Hydrolyzed Wheat Protein, Xanthan Gum, Sodium Carbomer, Phenoxyethanol, Isopropyl Alcohol, Parfum/Fragrance [Linalool, Hexyl Cinnamal, Limonene, Citronellol, Benzyl Salicylate] , Citric Acid. Great product! I use it overnight and shampoo my hair in the morning. My hair and scalp feels great. It has a nice fragrance and helps new hair growth. It cleanses the follicle area. I love it!!! I think that it's a great serum and my wife loves the scent. It's too soon to evaluate the effectiveness of Revivscalp, hair loss / regrowth wise. However, since using it (10 days only, with 5 to 6 applications), I believe my scalp is less oily. The consistency is adequate. A non-expected "side effect" is the fact that my wife does get really close smelling my scalp... ; ). One extra bonus for me is the international free shipping. I feel the serum working, I'll keep posted on results.